This would be about the most perfect way to spend a weekend in Ohio. Road trip.. to any or all of these Ohio’s Homemade Ice Cream shops. These are just a sampling of what Ohio has to offer! So you ask…which is the best ice cream? I must be honest with you….I am still searching. The choices below are some of the best ice creams in Ohio and across the USA. Enjoy this great article written by Anietra Hamper. Ohio has deep roots in the dairy industry so it is no surprise that the state produces stellar ice cream. 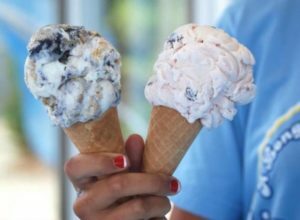 Some of the most famous commercial brands like Graeter’s Ice Cream and Velvet Ice Cream are Ohio-made and each August at the Ohio State Fair some of the best and biggest Vanilla, Strawberry and Chocolate ice cream cones are served up in Dairy Products Building. A number of Ohio-made ice cream establishments are dotted throughout the state. While July 16th marks national ice cream day, a road trip for a superior dip does not require a special occasion. After a day of hiking in Yellow Springs, I always stop at Young’s Jersey Dairy for a large scoop of homemade ice cream in a cone. It is the kind of experience that requires catching the first drips quickly due to the size of the scoop. I take advantage of the park-like setting with picnic tables outside to relax and enjoy the moment. Young’s ice cream is made in small batches right on the premises. While Vanilla, Mint Chocolate Chip and Chocolate Peanut Butter are the top selling flavors, the selection changes every month so there is always something new to try. If you ask around for the best homemade ice cream in the state, Tom’s Ice Cream Bowl will come up in conversation. The parlor, that still has many original features is a Zanesville tradition since 1948. There is a reason the word “bowl” is in the name. They serve up overflowing scoops of ice cream that your mother would scold you for dipping at home. The nuts for ice cream are roasted daily and the shop sells old fashioned candy and chocolates. Part of Tom’s appeal is the old-fashioned nostalgia that you feel when you walk through the door. One of the most popular treats is the banana split that is big enough to share. I remember years ago going to Columbus’ North Market on Saturday mornings with my mom and walking out with an ice cream treat from the small stall where Jeni’s Splendid Ice Creams got its start. Unique flavors like Juniper & Lemon Curd, Genmaicha & Marshmallows or Middle West Whiskey & Pecans promise a flavor combo like you’ve never experienced and that is part of the fun of Jeni’s. Jeni’s has obtained a cult following as much for the unique ice cream flavors as for the way the company sources ingredients like milk from Ohio farms and chocolate and vanilla from small organic farms. Jeni’s has expanded nationwide and there are usually lines out the door for the Ohio homemade ice cream. When you bite into an ice cream flavor like s’mores you already know the taste to expect, but with Handel’s ice cream you actually get a s’more. Chunks of chocolate and crunchy graham crackers with bites of tiny marshmallows. The flavor is decadent which is why Handel’s has expanded from its Youngstown roots, opening in 1945, to 24 Ohio locations and stores in seven other states. They continue to use old family recipes that originally called for actual ingredients that Mrs. Handel had around the house like fruit from her garden or ingredients in the pantry. The only thing more difficult than selecting a flavor of homemade ice cream at Johnson’s is choosing what to do with it. With a full menu covering a scoop of ice cream in a bowl to spritzers, shakes, floats, and sundaes you need to make several trips just to try some of the unique offerings. I went with the mint chocolate chip shake. It was thick and flavorful. It is no wonder that Johnson’s Real Ice Cream has remained a Central Ohio staple for more than 67 years. The fourth-generation family business that opened its doors in 1950 still makes all of its homemade product in Bexley but distributes its memorable taste to more than 300 restaurants. I am already planning my next visit there this summer. For more sweet travels, Find It Here at Ohio.org. This entry was posted in Best of and tagged Anietra Hamper, Ohio's Homemade Ice Cream, Ohio.org on July 17, 2018 by George Dunlap.